The second work was one I was a little more interested in checking out as it was by a writer whose work I’ve enjoyed before, Gao Xingjian. While all the work I’d previously read by the Nobel laureate had been prose works, the subject of this cahier is a short play, originally written in French, translated (by Claire Conceison) into English directly, but with a possible Chinese version in mind. but not a femme fatale. In the eternal struggle, Gao suggests that men need first to understand women to be worthy of them. There is an intense focus on what is going on around the actors, and the cahier is full of stage directions, descriptions of the background music, and the dances the two dancers are to perform. 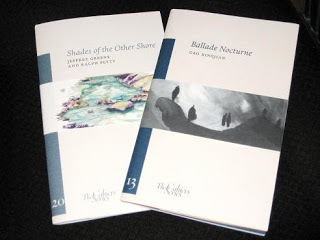 To an uncultured novice like myself, it’s all rather arty, and Ballade Nocturne is described in the translator’s introduction as a ‘polymorphic’ work, one which can’t be pigeon-holed into ‘theatre’, ‘dance’ or ‘art’. As always, there is an abundance of beautiful extras. In addition to Conceison’s insightful introduction, the ‘reader’ is treated to Gao’s beautiful ink-wash illustrations, as well as the original French-language version in a pamphlet insert. It’s a book which is a joy to read and admire – being totally honest, I’m not completely sure I’d enjoy sitting through the actual play though!